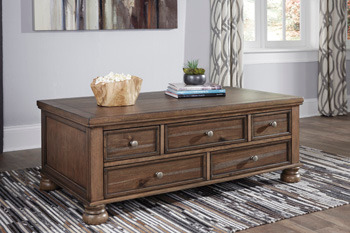 Sporting a clean-lined, hearty profile and complex chestnut-tone finish, the Flynnter coffee table brings home a richly rustic style that?s warm and welcoming. With five smooth-gliding drawers, this coffee table is packed with functionality. Prominent bun feet add shapely flair and classic charm.